Ray and Debi Schaffer of Waretown, New Jersey, wanted to build a timber frame home for their family that would highlight the pond on their 6.5 acre property. They loved the aesthetics of timber, its warmth and openness. Ray approached Quarry View Construction with a design and asked us to construct a timber frame structure from his plans. Typically Quarry View handles projects from early design to final construction, but our flexibility allowed us to meet Ray’s request despite starting out further along in the process. Quality workmanship is very important to Ray, who is a carpenter by trade. The Schaffers ultimately chose Quarry View over other companies not only because of our dedication to quality construction but also because he trusted us. Levi King, project manager for the Shaffer project, says building trust with customers is the cornerstone of Quarry View’s business. After several meetings, Ray entrusted us with building his dream home. 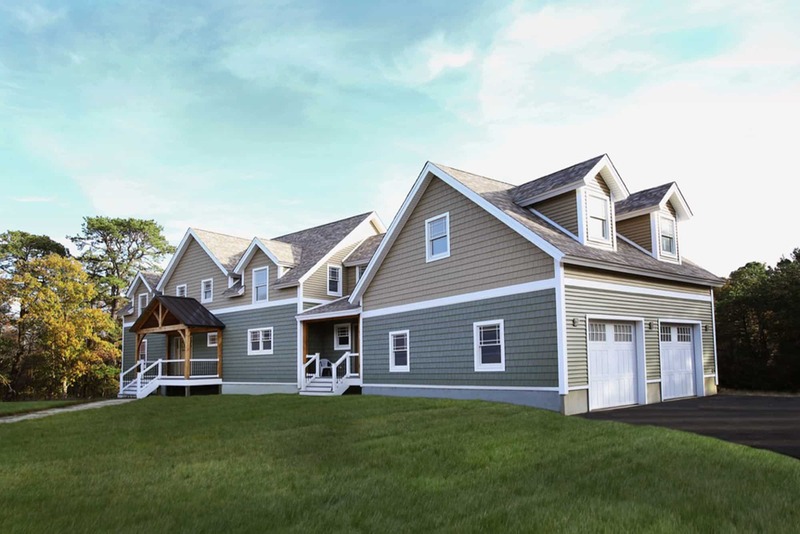 QVC worked with Ray’s design plans and began construction of a 2,800 square-foot timber frame home with a 1,500 square-foot walk-out basement. Since this was to be the Schaffer’s permanent home, where they raise their two sons, they wanted it to meet all their needs. The home features four bedrooms, two and a half baths, and a kitchen with a bar. A stunning great room opens all the way to the rafters and overlooks a pond through large windows with French doors. The second floor includes an office and two bedrooms that each have a small balcony. The breezeway features a front entrance and serves as a connection between the garage and the main house. It also holds a laundry room and pantry. Meanwhile, a patio extends from the rear of the house out toward the pond. The stick-frame garage holds a loft that offers extra space and boasts windows and dormers. We worked very closely with Ray and respected his dedication to the details of the project. During construction, we spent several overnight trips with the Schaffers and developed a personal relationship with them, deepening the trust that led Ray to choose us to build his home in the first place. Construction was completed in August 2016. From the great room to the balconies, the Schaffers say they’re thrilled with their new home! They love how the pond is the focal point of the home upstairs and downstairs, and our attention to detail and willingness to work with their design solidified the faith they put in us. Whether you’re looking for a timber frame home like the Shaffer’s or a timber frame wedding or horse barn, contact Quarry View Construction today to make your dream a reality.